The White House indefinitely delayed an anticipated announcement over changes to federal biofuel policies, potentially closing the latest effort to alter the Renewable Fuel Standard, according to three people familiar with the matter. Sen. Chuck Grassley (R-Iowa), who opposed the planned changes, and Renewable Fuels Association President Bob Dinneen said they were pleased President Donald Trump did not act to change the law at this time. Reasonable suspicion drug testing determinations are sometimes the most challenging aspects of a drug-free workplace program, yet can have a profound impact on safety, well-being and productivity. Join us on Monday, June 18th at 1:00 p.m. CT for an overview of the important aspects of reasonable suspicion drug testing related to your drug-free workplace program. This program is an exclusive offer to ASA Members and there is no fee to participate. The webinar is part of an ongoing series of ASA webinars covering safety issues in the workplace that are planned by the ASA Safety Committee. Thursday, June 14th at 2pm EST. Customer Experience has been called the last remaining sustainable competitive differentiator and has driven constant innovation in the B2C space in recent years. Join expert Brian Walsh as he introduces the methodology for B2B eCommerce, gives some real-world examples, and guides you to free online resources to help you continually improve your customer’s experience. Register here. The European Union on Wednesday announced it will start imposing duties from July on a list of U.S. products in response to President Donald Trump’s decision to slap tariffs on steel and aluminum imports from Europe. Distributors are experiencing tremendous impacts from the digital transformation of B2B commerce, from within and outside the organization. These impacts have caused waves of disruption that continue to accelerate, rather than subside. Rep. Brad Scheider (D-Deerfield) recently introduced a program showing high school students how to apply their STEM education to the manufacturing industry. Schneider launched the STEM Scholars program May 14 to give high school sophomores and juniors an up close look during the 2018-2019 school year at businesses in the 10th Congressional District where their science, technology, engineering and math skills are needed. Boshart housing kits come complete with wrench, additional O-ring and bracket and are available in standard and giant as well as in standard and double lengths. Pleated, string wound, spun poly, carbon block, carbon briquette etc. cartridges are available in a variety of micron ratings to meet your filtration requirements. Each month, ASA partners with Industry Insights and ITR Economics to compile data from wholesaler members that provides a snapshot on industry performance as well as how it relates to the broader economy. The value of this report is directly related to the number of wholesaler firms that contribute data each month - the greater the number of respondents, the more comprehensive and useful is the report and accompanying analysis. The participation deadline for wholesaler members to submit data for the May report is June 12th. Learn more about this FREE and EXCLUSIVE benefit that ASA members frequently use when making key decisions. The ASA Advisory Group represents our members as the voice of ASA in codes and standards activities. One way you can help is to take a look at the Weekly Standards and Codes Update List to review codes and standards that are out for public review or ballot. This week’s list includes: proposed revisions to standards covering gas transmission, distribution and gathering piping systems; and revisions to the AWWA standard for PE encasement for ductile-iron pipe systems. You will also note proposed revisions to ASHRAE 90.2 covering energy efficient design of low-rise residential buildings. ASA is speaking out against the proposed revisions along with other plumbing industry associations belonging to the Plumbing Industry Leadership Coalition (PILC) based on the proposed inclusion of flow rate and consumption values related performance requirements for plumbing fixtures (toilets and urinals) and fixture fittings (faucets and showerheads). These requirements are covered under other ASHRAE standards and including them in 90.2 will cause confusion in the marketplace. 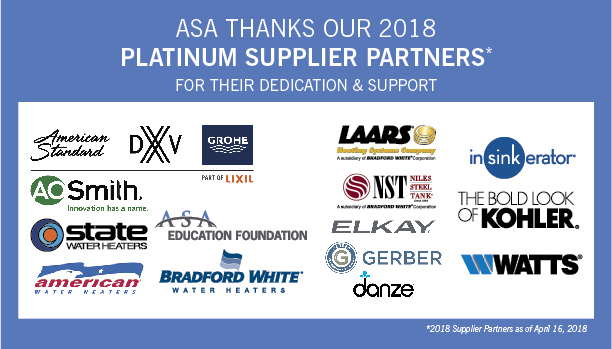 Workforce development and the future needs of the plumbing industry in filling jobs in the supply chain - including manufacturing, distribution, and installation – is a critical strategic driver of the American Supply Association (ASA). In part due to the efforts of ASA along with other industry associations like the Plumbing-Heating-Cooling Contractors Association (PHCCA), the U.S. Department of Labor released on May 10, 2018, a Final Report to the President from the Task Force on Apprenticeship Expansion. According to a study by ASA, roughly 200,000 people are currently employed in the manufacturing and distribution segments of the Plumbing, Heating, Cooling, and Piping (PHCP) and Pipe, Valves and Fittings (PVF) industry. In addition, the U.S. Department of Labor’s Bureau of Labor Statistics estimates that 400,000 installers are now employed. Thus, the plumbing industry is a significant source of high-paying professional jobs. Don’t miss out on HOLDRITE’s exciting offering for learners in ASA-U! Any learner who completes all of the HOLDRITE course offerings between April 5th and June 30, 2018, will automatically receive a bonus $50 BlueBucks upon completion and will be entered to win a drawing for $500 BlueBucks. Extend your learning, enroll today!